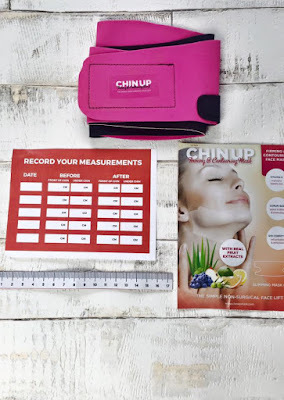 I was contacted by a company called ChinUp, they are a company who have designed a mask to give you a non-surgical face lift and to reduce fat around the face/chin. I must be honest I was really skeptical about this product but I was also intrigued by it. This is what comes with the mask. You get the mask itself, a slimming band, a sheet to record measurements and a small measuring tape. You are supposed to make sure your skin is cleansed and dry before using this mask. 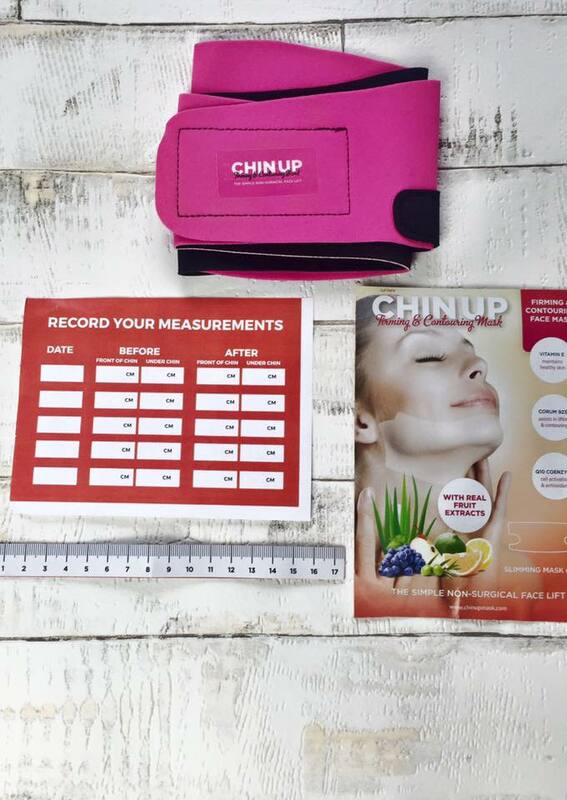 You start off by measuring your chin from ear to ear, across the front and also underneath. then write down your measurements so you don't forget. my measurements were 22cm on the front and 20cm underneath. underneath which is a 2cm reduction which is pretty good! Although I did have good results after using this i'm not sure if I would want to use this product again as it was uncomfortable to wear. The mask gave off a slight burning sensation to my skin which as bearable, but what I didn't like was how uncomfortable the slimming band was. It slipped off quite a few times and it also was uncomfortable on my throat area. I did have a 2cm loss but I didn't see any physical changes in my appearance when looking in the mirror, having said that It is recommended you used it once every other week so I think if you consistently used it you would see a physical difference, I just don't think I would want to use it that frequently. Would you want to try this out for yourself?